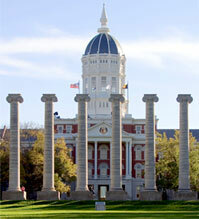 WHAT: The second annual Mizzou Veterans Week will be held in Columbia to honor and celebrate Mizzou veterans. The Mizzou Student Veterans Association, the Student Union Programming Board, MSA/GPC, Student Life and other local organizations will sponsor events throughout the week. Mizzou Veterans Week will feature events for students and community members, including a lecture from retired Adm. William J. Fallon, a household goods drive for veterans and a parade. For a complete schedule of events, see the attached list. WHO: All events are free and open to the public unless otherwise noted. WHEN & WHERE: Nov. 9-13, various Columbia locations, see attached schedule for specific event times and locations. Adm. Fallon will be available for questions from 4:15-4:45 p.m., Thursday, Nov. 12, on the second floor of the MU Student Center. For more information, please contact Kathy Murray at murrayk@missouri.edu. Volunteer cadets and midshipmen from various Mizzou ROTC programs will perform a vigil in front of the Boone County war memorials. A list of veterans’ names will be read during the vigil at the Courthouse ceremony. The Mizzou Student Veterans Association will hold a drive to collect household goods in support of the Housing Urban Development-Veterans Affairs Supportive Housing program that provides housing for homeless veterans. Arrangements can be made to pick up donations if needed. Contact Billy Froeschner at billy.froeschner@mizzouveterans.org for more details. This film, starring Kevin Bacon, examines the military rituals for honoring those who died in battle. The film pays tribute to the men and women who have given their lives in military service as well as their families. Sponsored by the MSA/GPC Films Committee and HBO Films. The parade starts at the Mizzou columns and goes to the Boone County Courthouse. Shuttle services will be available for rides to the vigil, parade and ceremony from 10- 10:30 a.m. in front of the Missouri Student Unions. The shuttle will offer return services. A ceremony will be held honoring veterans of the United States Armed Forces, past and present, concluding with a 21-gun salute. The traditional wreath laying ceremony will be held to honor MU student, faculty and staff veterans under the Memorial Union tower. Sponsored by the Student Union Programming Board. Supplies will be provided for students to create thank you cards for veterans to be dropped off at the Harry S. Truman Memorial Veterans’ Hospital near campus. Non-perishable items will be collected to support the 1140th Military Police Company of Fulton, which is serving in Afghanistan. The drive will continue through Nov. 20. A list of needed items is posted online at www.unions.missouir.edu/supb. Sponsored by the Student Union Programming Board. Recently retired Adm. William J. Fallon, U.S Navy Commander, U.S Central Command will speak. During his 40-years of service, Admiral Fallon led U.S allied forces in eight separate commands and played a leadership role in military and diplomatic matters at the highest level of the U.S government. He directed all U.S. military operations in the Middle East, central Asia and the Horn of Africa, focusing on combat efforts in Iraq and Afghanistan. A reception will immediately follow the presentation. Sponsored by the Mizzou Student Veterans Association, the ORG, the Department of Student Life, the MSA/GPC DSA Speakers and Special Events Committees, and the Vice Chancellor for Student Affairs. For more information or to register for the third annual Mizzou Student Veterans Association Banquet, e-mail nmkc73@mail.mizzou.edu.